Shop owner Alastair 'Breeks' Brodie and landlord Shaheed Jamal. An iconic Dundee record store, beloved by hometown browsers and visiting stars, has been saved from the axe. Groucho’s, which opened more than 40 years ago, was facing closure after the shop’s landlord announced he was selling the premises in the Nethergate. Owner, Alastair ‘Breeks’ Brodie, said he could not relocate to another building, due to health reasons, and had decided to retire when the lease ended in August this year. However he has now revealed a deal has been struck with new owner of the building Jamal Property World which will extend the lease by five years. 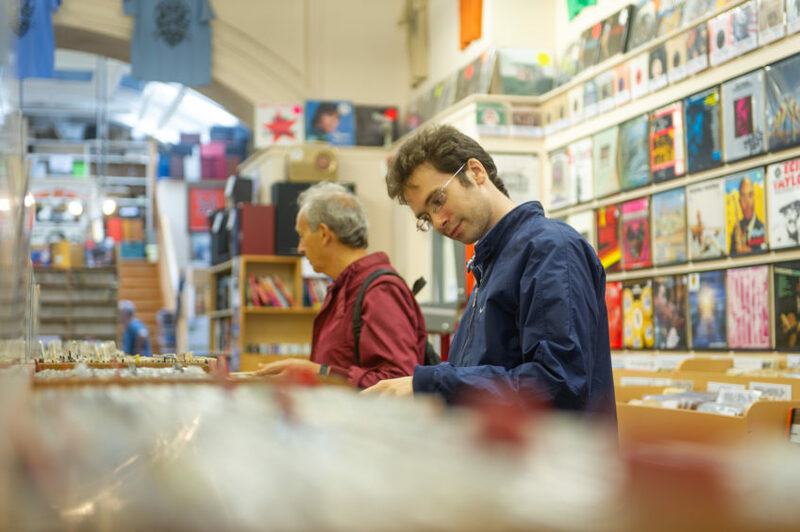 Alastair, who opened the store as a 22-year-old, still intends to hang up his headphones but is hopeful that a buyer for the business can be found now its longer term security is assured. “It’s a relief,” he said. “I was concerned that if we didn’t get an extension on the lease we’d have to clear out the shop. “We have been asked umpteen times a day about the future of the store. We’ve been quite amazed by the amount of goodwill from the customers. “For 43 years we’ve been keeping customers happy and we want to keep doing that. “There are people who come in everyday. Friends meet here. Bands have formed after meeting in Groucho’s. It’s been a great life. He added: “I would still like to sell, because of health reasons and to retire, but somebody taking it on will have that lease. 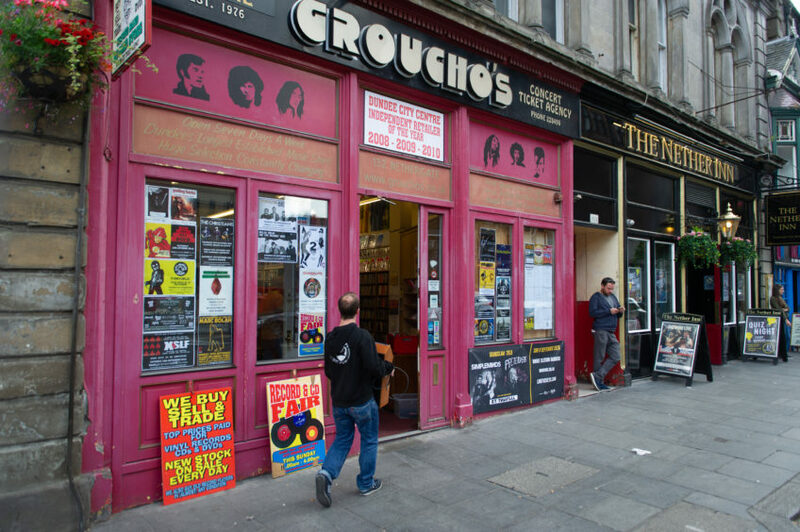 Among the high profile fans of Groucho’s is Johnny Marr, former guitarist with The Smiths, who said it was one of his top two record shops in the UK. It has been based at the Nethergate for 19 years, having moved a few times since it first opened on Perth Road in 1976. Thousands of people from across the UK have revelled in the good news. Dundonian Courier columnist and sports broadcaster Jim Spence said: “I’m delighted for Breeks. Alison Henderson chief executive of Dundee and Angus Chamber of Commerce said: “It’s great to hear Groucho’s having its future confirmed. “The store is a Dundee institution and retaining independent businesses like this in our city is key. The council’s city development convener Lynne Short said: “When people talk about Dundee and culture like it’s a new thing you just have to look to the joy that has been shown for Groucho’s. 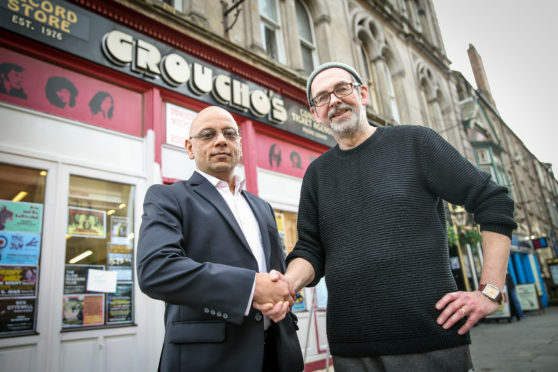 Landlord Shaheed Jamal, director of Jamal Property World, said: “Groucho’s has been there for as long as I remember, so we are happy to have agreed on a five year extension.